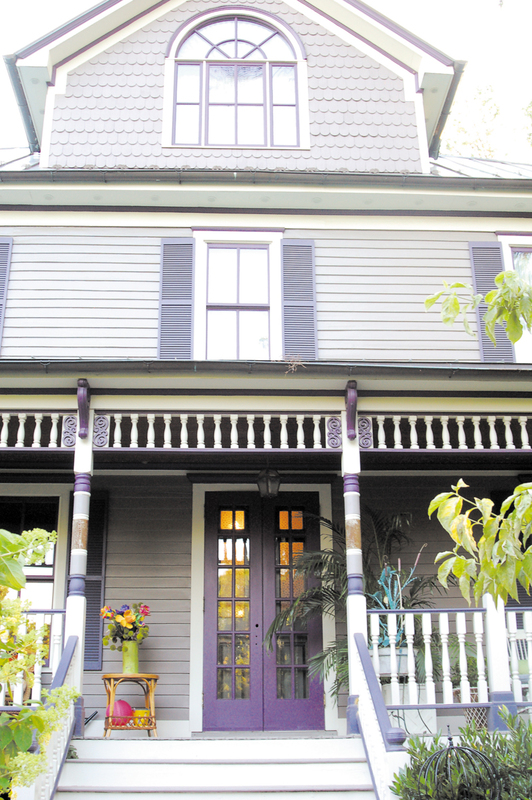 A three-story, plum-tinted dream house tucked away in a lavish Victorian garden sits on East Jefferson Street in Falls Church, but this pretty picture wasn’t always so fairytale-esque. Inside its decades-old walls are photo albums documenting its four-year-long journey from shambles without plumbing to a home that’s since housed years of memories for one family. “I thought my husband was crazy. It was an absolute, falling down wreck,” said homeowner Barbara Cram, past winner of the Chamber of Commerce’s Pillar of the Community Award. That wreck soon turned into what’s now been featured in the Washington Post, Washington Home & Garden Magazine and as a tour stop on Virginia’s Historic Garden Walk for its elaborate blooms and foliage. From demolition to renovation, Cram attributes her patience to an inner urge of sorts that she says not every homeowner has. “I think it’s a calling to want to do this. [laughs] It’s kind of like love at first sight,” said Cram. Flash forward years after acquiring the work-in-progress and Cram isn’t the only one head over heels for the estate-turned-prized venue for locally-sponsored functions. The Victorian Society used the home for their Progressive Tea fundraiser where all members in attendance dressed in era-appropriate clothing. Local writer and author Kathleen McCleary, who just published her first novel House & Home, celebrated the book’s release with a book-signing soiree at the residence after being pitched the idea by neighbor Cram herself. “When I was first house hunting in the neighborhood, I just couldn’t believe that I could concentrate living across the street from such a magnificent residence,” said McCleary. Moving to the corner of East Jefferson and Cherry Street four years ago, McCleary, a mother of two small children at the time of uprooting from Oregon, was greeted by a showplace garden left behind by the previous homeowner who had a knack for gardening. Appreciative of the blossoming eye candy, a few changes were in order if she wanted a yard open enough for her tiny tikes to run around and do cartwheels in. “The yard was in total disrepair for a few months and I’m sure the neighbors were horrified as to what was going on. [laughs],” said McCleary. 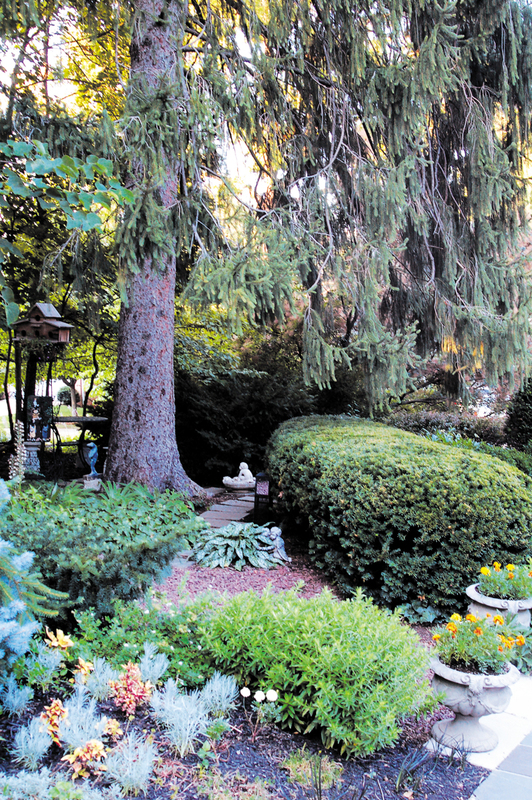 Like any new homeowner, the McClearys personalized their landscape upon arrival, tearing up an old boxwood tree the previous owners had left. The result? Their dining room, where they eat breakfast, lunch and dinner, now looks out over the entirety of Cram’s garden. “It’s a view better than Barb probably has herself, so we’re really enjoying the fruits of her labor,” said McCleary. That’s two decades of labor to be exact. At McCleary’s book signing, glimpses of pre-renovation snapshots wowed guests who had no idea about the kind of disrepair Cram and her husband started with. While transforming an architectural diamond in the rough may not be for everyone, Cram advises aspiring green thumbs to aim high but start small when it comes to getting their garden off the ground. That doesn’t go to say that Cram sits back as Mother Nature magically sees out all of the upkeep. McCleary often sees her outside hauling mulch, planting and digging for hours each day. For someone who is so hands-on and invested, Cram easily related to the McCleary novels’ main character Ellen who is forced to leave her beloved Cape Cod home behind when her family moves. “A couple of passages got [me] choked up because for people who are building a family in a new place, it kind of becomes part of the family – it’s hard to separate the family and the house that it happens in,” said Cram. While McCleary is reluctant to draw any direct parallels to between Cram and the fictional character, she saw how the plot was able to tug on the heart strings of home-nurturing Cram, saying that a house “starts to feel like a child” when you it’s from such disrepair to a home like she’s done. Cram, currently president of the Sterling-based landscaping company Greenscape Inc., hasn’t always been in the home and gardening business. After working on the Nixon campaign during the Watergate Scandal, and in the White House for two years following, Cram became pregnant with her second child. Soon after, she followed her passion and started her own landscaping business, formerly known as Mother Nature’s Movers. Reminiscing back to the days of riding passenger-side in her granddad’s tractor, gardening’s been Cram’s forte as far back as age six when she was already planting fire bushes. “Ever since I was a little kid, I’ve been planting seeds. I always joke and tell people I changed from politics to get down to the real dirt,” said Cram. Cram’s people-person charm is what first drew her to politics, though she can appreciate that, unlike people, plants “do what they’re supposed to do,” aside from a little roots bullying she warns new homeowners about who’re working with a fresh landscape. “You want to get in and plant everything at once because [the plants are] growing together and they’re not fighting. It’s like growing up with your brothers and sisters – you learn to share the food and everybody gets enough,” said Cram. According to Cram, a common mistake new homeowners make is misjudging the size of what they’re planting. After witnessing substantial damage to a couple’s home caused by a tree planted too close to the siding that eventually began to push its way inward against the structure, Cram advises planting trees no closer than 10 feet away from a house. “Everyone wants to have that nice cozy feeling but you have to be careful,” said Cram. Aside from proceeding with caution, Cram suggests approaching your grassy palette with a sense of reality, assessing just what your space is made of. Your neighbor’s new patio might echo the mental picture of that perfect summer barbeque nook you never had, but it may just not be practical for you. “You see someone’s yard and say, ‘That’s what I want our front to look like,’ but if you don’t have 70 feet of space then you’re not going to have that,” said Cram. Instead, Cram recommends focusing on certain aspects of the landscape’s layout that you find appealing. For instance, if you envy a space that’s nestled in, aim for a tumbling effect with staggered foliage. If you’re not quite ready to commit to a huge change, opt for a simple spring cleanup through a landscaping company. This will usually include edging all the beds, weed removal and laying down fresh mulch, which can make a big difference for a house on the market being looked at by potential buyers. “This looks fantastic and makes everything look neat and in the heat of summer, the neater it looks the better,” said Cram. This season, consumers are starting to catch on to the benefits of self-watering container gardening, where reservoirs automatically detect when a plant needs a hit of H2O. Revamping the old pod-insert design to something more marketable to the masses, the sub-irrigating technique is starting to take hold as one the latest trends in gardening. “They’re making them in much prettier colors and now there’s more of a draw because people don’t need someone to come over and water their plants three times a day,” said Cram. 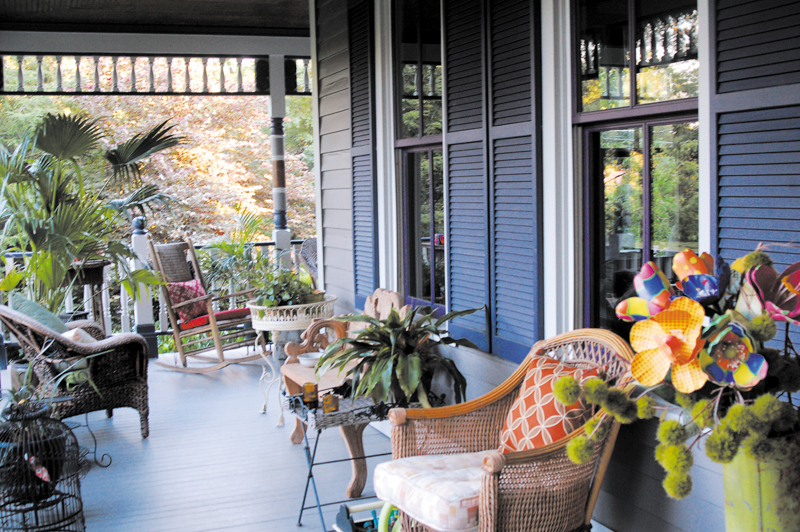 In the end, McCleary and Cram both agreed that more than what gardening trend you choose to employ in your front yard or just how cozy that weeping willow make your house appear to strangers, it’s the memories made inside the home that are most valuable. “It’s always the people inside its walls [that make a house a home],” said McCleary. “The thing about the Crams’ home is it represents 22 years of loving and restoring a home from something that I think was lost and decrepit into a beautiful, warm, welcoming haven for anyone who walks through the door.